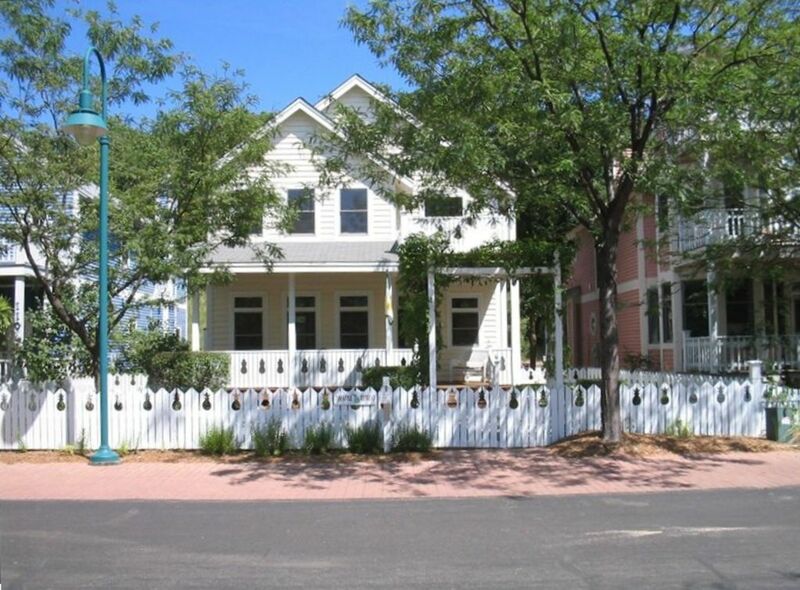 The Pineapple Retreat is located in Michigan City's acclaimed Beachwalk Resort Community. Beachwalk hosts a variety of things to do. We have our own private Lake Kai, beach volleyball, heated swimming pool, playground for the kids, tennis courts, basketball court, putting green, and park. Located on the shore of Lake Kai, we have a Cafe where you can enjoy breakfast, lunch, and dinner if you don't feel like cooking in our gourmet kitchen. Beachwalk offers concerts in the summer along with a craft show on the weekends. The Pineapple Retreat has a master bedroom, king-size bed, adjoining bath, and private balcony. The second bedroom has a queen-size bed with adjoining bath. The third bedroom has two sets of bunk beds, and the fourth bedroom has bunk beds with a full bottom and twin top. The first floor has a living room with a queen sofa bed and full size futon, dining room seating for four, island seating for five, kitchen table seating for six, and table on screened-in porch which seats four. We have provided for all your needs by including a hair dryer in each bathroom, a high chair, a stroller, picnic basket, army beach blanket, and beach chairs. You can walk to Lake Michigan and Sheridan Beach, just one half block away from the Pineapple. On Sheridan Beach you can enjoy swimming, windsurfing, jet-skiing, sailing, fishing, and watching the sunset over the Chicago Skyline. Other attractions in the Michigan City area include Washington Park, a 90-acre public park for walks and family gatherings, and Washington Park Zoo, both within five minutes of Beachwalk. We are just 22 miles from the Notre Dame Football Games in South Bend, Indiana and 68 miles from Chicago. Our home is great for family vacations, family reunions, or business meetings. Just outside of Michigan City is the Indiana Dunes National Lake Shore and State Park, which has 8,500 acres of bogs, coastlines, forests, and Mount Baldy. Activities at the State Park include hiking, biking, picnicking, and walking. The Pineapple Retreat provides putters and golf balls, basketball, tennis rackets and tennis balls, and volleyballs. No Pets allowed and No Smoking. Available Year Round. For additional information: Contact the agent for this property - this home is individually owned and managed. Sorry, no prom rentals. Great stay and great location for families! My family and I had another great vacation at the Pineapple Retreat! We couldn't believe it had already been 5 years since we had been there before and we don't know why we waited so long. The house is SO nice. They provide everything you might need including a wagon, stroller, booster seat, beach bag, beach blanket, movies, you name it! We enjoyed the pool a lot! The kiddie pool was great for my toddler. The beach is a 5 minute walk away. And we also enjoyed the Washington Park Zoo that is a 3 minute drive, if that. Thank you, again! We had a girls weekend at the Pineapple Retreat and had the best time. The house is in a perfect location and so close to the beach. The community is absolutely adorable as well. We did the winery tours and were in great location to that. There was a small hiccup in checking in, but the owners were very accommodating and sincere. The owners respond quickly and will help with any recommendations. Even though we did a girls weekend, this house is perfect for families as well. The house is set up in a great way with plenty of beds to sleep. Loved the back patio area and grill! All the linens and kitchen utensils are provided. They have many spices and condiments available for use. I would recommend this to any of my friends and family. Great location, great house, great owners. Thank you for everything! 1) The kitchen and family room open layout is very inviting, comfortable and great for conversations and fun. 2) A spacious kitchen stocked with every utensil and appliance you will ever need plus spices, condiments, and other essentials. Ideal for anyone who loves to cook and/or eat! 4) Few minutes’ drive from the Washington Park Zoo, the outlet malls, and great restaurants (Shoreline Brewery, Stop 50 Pizzeria, and Pickle & Turnip – yum!). We very much enjoyed our time at the Pineapple Retreat and I’ve already recommended it to family and friends. We will definitely be back!!! We stayed for a short weekend, but wish we had booked more time. The home is perfectly positioned in the Beachwalk community. Walkable within a half of block to the beach or pool. It appeared golf carts were available for rental as well if needed for $80/day. The house is set up nicely for two families sharing. There are two larger rooms with king/queen beds and then two smaller rooms with bunk beds for kids. An open concept LR kitchen with a great front porch area and back screened in porch. Nicely equipt with kitchenware. We had a great stay! This home is absolutely perfect for a beach vacation getaway. It is really beautiful with a great open layout on the main floor and spacious bedrooms upstairs. We had two families with 5 kids total, but could have easily had another family. Pineapple Retreat is filled with everything you could possibly need--from a sandpit for the kids to play in to beachchairs to beach coolers to games for kids and adults to a fully stocked kitchen (more dishes, cups, wine glasses, cookware, spices and condiments than you could imagine.) It is the perfect distance between the pool and the beach. We kayaked, learned to paddleboard and spent countless hours at the beach and playing in the pool. Wonderful home and wonderful vacation. We run a Friday to Friday, weekly rental only during the summer months, schedule. There is also a resort fee of $10/person that will be deducted from the security deposit.